Chongqing is a city and one of the four province-level municipalities in China officially known as Special Economic Zones (SEZ). The other three are Beijing, Shanghai and Tianjin (City). Although the city itself 'only' has around 6 million inhabitants, the total municipality is one of the largest in the world, with well over 30 million people living here. Although like the other SEZ's most of the area is rural. Chongqing has the largest population in West China and is the focus of China's "Go West" development strategy. As a result, it is a very lively and rapidly modernizing city, although it does get a bit too hectic most of the time. On the surface, the city appears rough around the edges and a bit gritty and thus there may appear to be not much to do in the daytime, but further investigation will uncover a city with truly its own character and a number of interesting sites actually worth looking into. HongYaDong - Near Jiefangbei, a recreation of the old Chongqing, clinging to the side of the mountain with many small shops. A tourist place but you can find recreations of old local crafts here and genuine local food. Great Hall of the People - Chongqing's Great Hall of the People (and the People's Square in front of the Hall) is an architectural symbol of Chongqing City. Its construction began in 1951, but its design is traditional and mirrors those of China's ancient classical dynasties. It somewhat resembles an enlarged version of the Temple of Heaven in Beijing. The People's Square was only completed in 1997 and is decorated with trees and flowers. The ground of the square is paved with smooth marble tiles; there is magic music fountain; at the southern end of the square stands a stage for performances in the open air. You may see thousands of people dancing on the square in the numerous beautiful lights in the evening. The buiding is to be seen from the outside, no need to pay the admission fee. ¥10. Three Gorges Museum - Across the People's Square is Three Gorges Museum, well worth a visit for its exhibits on the Ba culture and the area of the three gorges downriver from Chongqing. Also noteworthy are a series of exhibits on life in Chongqing during the Qing dynasty, the early republic, and the World War II era. Chongqing has a subtropical climate with humid conditions. Summers last from June to September when temperatures average between 27 and 33 °C during the day and between 20 and 25 °C at night. Temperatures of 40 °C or even more are not uncommon and the humid conditions make this probably the worst time for a visit. Winters are actually better though temperatures are not really great: between December and February it is around 10 °C during the day and a few degrees less at night. Occasionally temperatures drop close to zero but rarely below. It is the driest time of the year with just around 20mm of precipitation a month, against 150-200mm a month between May and July! Obviously, good months for a visit, are the spring and autumn periods (March-April and September-November). Chongqing Jiangbei International Airport (CKG) is about 20 kilometres from the city centre of Chongqing. About a dozen of airlines, among which Air China, China Southern Airlines and Sichuan Airlines offer numerous domestic services. Destinations include Shanghai Pudong International Airport, Beijing, Chengdu, Lhasa, Guangzhou and Shenzhen. International destinations include Bangkok, Hong Kong, Nagoya, Tokyo, Seoul, Taipei and Singapore, mostly with Air China, except Singapore. There are three train stations in Chongqing: Caiyuanba (in Yuzhong District), Shapingba (in Shapingba District) and Chongqing Beizhan (in Jiangbei District). High speed trains (G series) link to Chongqing North Station to Beijing in about 12 hours, and to Chengdu in about 1.5 hours. In addition, there are slow trains that take about twice as long. The longest railway trip from Chongqing is from Harbin to Chongqing North, a 48.15-hour, 3,535 km ride. The price of hard ticket is ¥344 and hard berth is ¥599. Most train tickets can be purchased through the help of the hotel your are staying. The tickets are then delivered to the hotel for you to pick up. Long distance buses travel to Chongqing from almost anywhere. There are numerous buses into Chongqing, most notably is the hourly service to and from Chengdu, Nanchong, and Xi'an. From the west Chengdu is 2.5 hours and to the east Wanzhou is three hours, both on good highways and good buses. Avoid the "sleeper" buses as they must be the most uncomfortable way to travel ever invented. The main bus station is at Cai Yuan Ba (pronounced Tsai Yuan Ba, is the old station), next to the Chongqing train station. It is complete mayhem most of the time - people in Chongqing do not queue. Many hotels will sell rail tickets thus avoiding the madness of the station. There are quite a few options to travel by boat downriver via the Three Gorges towards Yichang. Taxis in Chongqing are bright yellow small sized Suzuki sedans. They are relatively cheap (starting at ¥8 and ¥1.8/km, ¥8.9 and ¥2.25/km after midnight) and can be easily found 24 hours a day. Few drivers speak anything but Chinese, so you must know where you are going. Either have your destination written for you in Chinese, learn how to say it, or be able to direct the driver. A good way to use taxis is to gather cards from hotels, then simply show the driver the one you want to go to or is nearest to your destination. Caution: Empty taxis are hard to find on extremely hot days. It is advisable to seek alternative transportation or stay indoors. This is because most taxis have A/C running, thus requiring more frequent natural gas refills. There aren't enough natural gas stations around and the pump pressure is frequently inadequate, so many taxis will be stranded lining up for gas. Chongqing Metro offers extensive services in the urban area. The first section of Chongqing's rapid transit system opened in 2005. Since then, major expansions have now linked major railway stations, major shopping districts and the airport, with more extensions under construction. Announcements are made both in Mandarin and English. No smoking is allowed and all services are air-conditioned, which is a reason alone to board one from between April to September! Don't forget your electronic ticket card to get out of the station. If you overshoot your stop, just go to the service counter and add value to your card. Line 1 Chaotianmen to Shapingba, Daxuecheng, east-west heavy rail metro line. Handy for visiting Ciqikou, Jiefangbei, or Chaotianmen. Line 2 Jiaochangkou to Yudong, monorail line. Convenient for visiting the Zoo, Stilwell Museum, Jiefangbei, Jiulongpo, Peoples Hall and Three Gorges Museum. Line 3 Ertang to Jiangbei Airport, monorail line running north-south. Convenient for Chongqing North Railway Station, Guanyinxiao, Chongqing Central Railway Station, Chongqing Garden Expo site, NanPing, and airport. Line 6 north-south subway line, connects Beibei in the northeast with Chayuan in the southeast, thru Yuzhong district (near Jeifangbei) in central Chongqing. Jiangbei (Northplace) which includes Paradise Walk shopping center - There are two bus stations near the pedestrian street (Guanyinxiao). 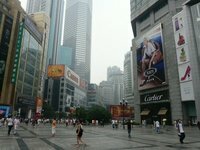 Jiefangbei, the primary centre of Chongqing, contains a pedestrian mall with a major shopping and entertainment centre and a series of supertall skyscrapers around the Jeifangbei monument. There are two bus stations in Jiefangbei, south and west of the monument. The bike is the worst choice for people who understand the layout and structure of "the mountain city". Added the fact that it is incredibly dangerous to bike on city streets it is just not a good idea. First timers to Chongqing should be warned it is very easy to get lost due to the many hills and valleys and the two major rivers. Chongqing is a harbor city and with this comes what is called dockside culture (matou wenhua). This culture is blamed for a lot of things from cursing profusely to...Hot Pot. While many great restaurants abound in the city, memorable dining is best along Nanbin Lu with incredible night views back across the Yangtze River with the Jeifangbei city skyline lit-up. There are many "Western Restaurants", but it is very difficult to find any real western food in them. Many smallish restaurants will have a reasonable stab at spaghetti bolognaise, and some will have menus in "Chinglish" and even pictures of dishes. However as an exception, you can find quite nice fusion dishes (ranging from Japanese Sushi and Tempura to American Sirloin Steak. Hot Pot (huǒguō, lit. : firepot) is one of Chongqing's claims to fame. In cities across China, one can find hot pot restaurants, but only Chongqing people can really stand a real hot pot, so if you want authenticity, get it while you can in Chongqing. When ordering hot pot you have a choice between three kinds. First, the spicy version called red soup (hong tang). Then there is one without any spices. This is basically a bone soup, and it is tasty. To get this, simply ask for "yuan wei" or tell them "wo bu yao la" which means "I don't want the spicy stuff!" Finally there is a compromise with Yuan Yang Hot Pot (Yuan Yang Huo Guo), which is basically a pot split down the middle with the spicy stuff on one side and the mild on the other. For those who like spicy but do not like it too spicy, it is possible to order red soup without the jolt (wei la hong tang). It is a nice mild experience. For those who can not speak Chinese, it would be best to grab a Chinese friend to take you, though be warned, you will have to put up with a lot of drinking, you will be forced to smoke more than you normally would, and some of the things they go slipping into the pot might not be your cup of tea. You will also have to be aware that you will be fed with a lot of dishes from your Chinese friends because they like to see your bowl is full of food. You might feel a little uncomfortable being fed like a child, but that is the way Chinese people show concern and enthusiasm towards their friends, especially when eating hot pot. There are many bars in Chongqing, but most are underpopulated. Generally the local bottled beer is ¥10, and the variety includes several local beers and even Guinness (expensive) on occasions. If you go to one of the small restaurants to eat, you can buy bottles of local beer at ¥3 upwards. There are hundreds of hotels all over the city ranging from dormitary style for ¥30 per night, through three star equivalent hotels for ¥150, up to the numerous top western hotels for ¥600-2000 per night, and many more are being added and currently under construction. Most hotels are rarely fully booked. You can always check the room before you commit. We have a comprehensive list of accommodation in Chongqing searchable right here on Travellerspoint. You can use our map to quickly compare budget, mid-range or top of the range accommodation in Chongqing and areas nearby. This is version 19. Last edited at 9:18 on Aug 21, 17 by Utrecht. 21 articles link to this page.